"Reliable And Friendly DJ With 20 Years' Experience"
We here at Mega Beats are committed to providing a great mobile disco at very competitive prices, with quality lighting and lasers, a professional grade sound system and a large music collection from the 50s to the present day. We also supply, photo booth, venue uplighting, sweet candy cart, fun casino tables, and so much more. We cover all ages for birthdays, with games and action songs for the younger ones. We offer current chart music for the teens, and a wide mix of music styles for adult birthday parties. For weddings we will work with you to help make your special day the best day of your lives, including help PA for speeches, colour theming if required, uplighting, and of course that special first dance. Also can supply, photo booth, 4ft 'LOVE' letters and so much more. 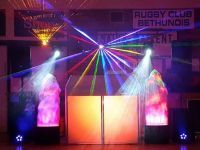 We also do many other types of discos from engagements, surprise parties, anniversaries, school proms, corporate events, office Christmas, new year's eve, hallowe'en, St Valentine's day, fancy dress, themed parties (60s, 70s, 80s, 90s), hen parties and house parties. Required by many venues, Mega Beats Disco has not provided satisfactory evidence of having current PLI available. Also required by many venues, Mega Beats Disco has not provided satisfactory evidence of having current PAT records available. Why do people choose to book Mega Beats Disco? Information provided was clear cut, it was a good price which included extras. "The DJ could have engaged with the crowed more to get them to dance." "Frank was absolutely perfect for the wedding, he knew exactly what to play and had the whole room dancing from the start of the evening till the early hours of the evening - he sorted everything we asked of him, and supplied all his own lighting, dancefloor, and photobooth. 5 stars is not enough! Frank will not disappoint! " "Thank you, great review, great evening, Would DJ for you both anytime"
"Frank was very entertaining, we would definitely book him again . Great value for money." "Frank was awsome such a lovely man, knew his stuff pleasant and a hit with everybody. Would not hesitate in using frank again for any other event. Highly recommended thanks Frank x"
"Thank You, Would love to dj for you again anytime"
"Everyone had a great evening and Frank providing a fabulous service, would definitely recommend. Also a lovely down to earth chap, will NOT screw you over! " "Fantastic, thank you very much Frank. If we need a Dj in the future I know where to come :)"
"Frank was brilliant! We will definitely be using Mega Beats Disco again next year. Great music and very professional, organised and helpful. Thank you Frank." "Frank from Meagabeats disco was fantastic I would highly recommend. He kept 50 4-5 years entertained for two hours. Thank you again Frank and team :)"
"Frank was excellent. He provided the uplighting for the ceremony and wedding breakfast as well as the disco set up. He was such a lovely guy and we wouldn't hesitate to recommend him." "frank provided exactly what was required to a very high standard." "Frank was on time, clearly explained what he needed, catered to the kids when there were only 4 dancing. He was friendly & tidied up quickly at the end. Very good!" "Frank was brilliant! He was at the venue and set up even before we arrived to set up. He was very friendly and interacted really well with us and the guests. He even let my 6 year old look at the equipment and play at being DJ for a little while - my son was over the moon! Frank helped to make it a fantastic evening and I will definitely use him for our next big event and recommend him to any friends looking for a DJ. " "everything went perfectly, provided my chosen playlist along with other good songs, made everyone laugh, got everyone dancing, all round friendly family guy, also with his daughter who was a lovely girl and helped all the oldies out with the dance routine - will definitely use again in the furture for all my events, amazing value for money as well! thank you!! " "Frank was the dj for our wedding. He was brilliant! Professional and friendly. If I was in need of a dj again, Frank would be top of my list." "Frank got it just right!! The kid's feedback was 'best party ever'!!! Can't say more than that!!" 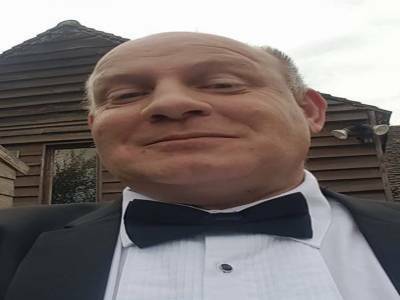 "Frank catered for a mixed audience, great for our Wedding Celebration Party." "Great time had by all Frank was very friendly and did a fantastic job have recommended to my friends and would use him again"
"Frank was brilliant good tunes git all the kids dancing and playing games. Would definitely recommend him to friends and use him again"
"Thank you for a great review"
"Thank you for review, And i look forward to coming back"
"Frank was great, played all the music we wanted and helped make it a special wedding day for us." "Thank you for a great review,"
"Frank was brilliant and I would thoroughly recommend him. Also thinking of booking him for my twins 21st birthday next year." "Very good value for money. Frank dj'd for a kids 5th birthday party and kept the kids pretty engaged the whole time with a variety of games and even little toy prizes, glowsticks and balloons which added to the fun. A decent amount of lighting equipment and proper dj booth etc all added to the atmosphere." "It was a great pleasure having Frank DJing at my party. It was a surprise 50th birthday party for my partner and Frank got everything spot on and played exactly the type of music that I wanted. He had everyone on the dance floor and was great with requests and nothing was too much trouble. He was quick and efficient setting up and packing up afterwards, despite the small time-slots that the venue allowed. The only reason I didn't give 5 stars for the lighting is that the layout of the venue didn't lend itself to a mega light show and I had originally turned down any additional lighting & effects anyway, Frank made the best use of what was there and I certainly didn\'t feel anything was missing. My only regret from the evening is that I didn't always get the time to make sure Frank was sufficiently fed & watered, Frank if I neglected you, I am sorry! Definitely would use Mega Beats again and will definitely recommend him, thank you!" "Fantastic DJ who made the night! Did a few games for us which got all guests involved. Would highly recommend." "Had a great night - thank you!" "Frank was great. The dance floor was empty at the start of the night and frank was right in saying he will get people dancing. He sure did that !!!" "Frank was super! We hired him for our daughters 14th birthday. He was in contact with myself prior to the date and on the date to reassure me. The girls were all dancing which is always a great sign and I would be very happy to recommend him to anyone for any occasion. Very happy." Mega Beats Disco also offers a range of additional party services not directly linked to musical entertainment. You may contact Mega Beats Disco directly using this form. If you are contacting Mega Beats Disco about an event, it's always a good idea to include the DATE, LOCATION, EVENT TYPE, AGE GROUP and TIMINGS to speed things up!